A Manchester Lions' Club fundraiser Saturday styled after "The Amazing Race" TV show raised the money needed to pay for Ruth Short's special high-tech glasses. 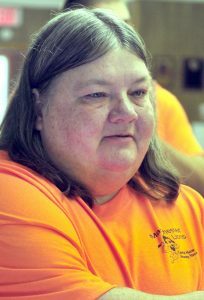 MANCHESTER — In the middle of the genial chaos at the Lions Club, Ruth Short wiped the tears from her eyes Saturday morning for maybe the second time, and she expected to do it many more times before the day was done. 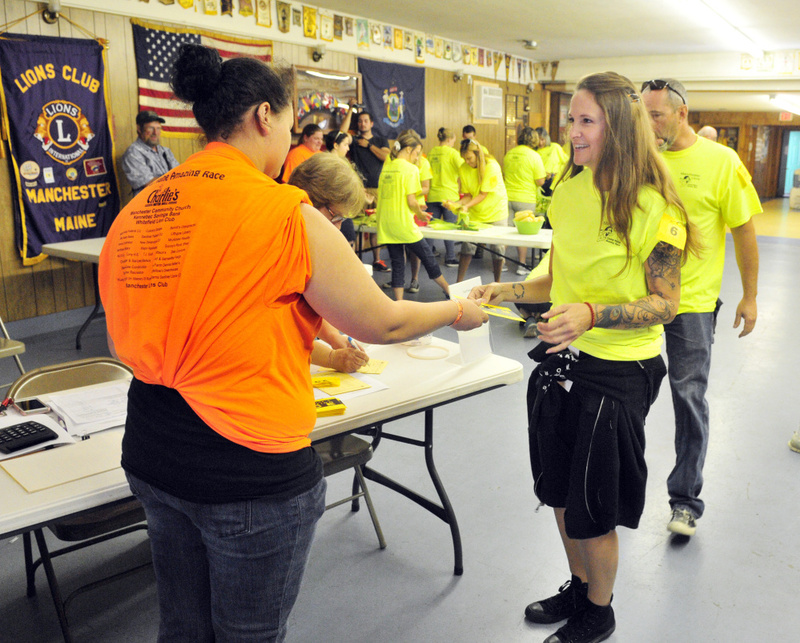 The Central Maine Amazing Race fundraiser was held Saturday at the Lions Club in Manchester to help Ruth Short, seen above, get specialized new glasses. They had raised the $7,000 that Short needs to be able to buy the specialized glasses the Farmingdale woman needs to see again, and just a little bit more that will go into a fund to help someone else. Short, 56, has macular degeneration, macular edema and glaucoma. The diseases that affect the retina and the optic nerve have robbed Short of much of her vision. Because she can see only shadows, she had never clearly seen her grandson or her great-grandchild. But in a little over a month, Short will be able to see whatever she wants to, including her great-grandson, who was born just five weeks ago. Short has been used to being the person who gives her time and talent to others, and so to be the focus of so many people on Saturday was overwhelming. For 20 years, Short worked at the Edgewood Rehabilitation and Living Center in Farmington, but she had to give that up when her vision became a liability. And while she lived in Vienna, she helped out whenever she could at the fire station. “She used to do anything and everything imaginable — field trips, PTA, everything,” said Elizabeth Ward, Short’s daughter. At least some of that ethic has rubbed off on Ward, who discovered the technology by chance. Earlier this year, she was returning to Maine from a trip to with her grandmother to Florida when a storm here delayed their plane’s departure from Tampa. Stuck at the airport with little to do, she turned to her smartphone for entertainment. She came across an ad targeted at the vision-impaired and it led her to a YouTube video produced by eSight, a Canadian company. “I watched the video and I just started bawling,” said Ward, who lives in Auburn. She wanted that for her mother and started searching for the technology, still sitting in the airport. The company has created a visor with LED screens that capture in real time what’s going on and allow the wearer to see clearly what’s going on. The glasses can take pictures or be plugged into a computer. Short was skeptical because they had come across other devices that offered more than they delivered, but Ward was adamant that her mother should try it. Ward arranged for a demonstration in March in Boston, and it was a revelation. With the visor, Short could see her daughter, whom she had not seen clearly in 17 years, she could see across the room, and she could see inside a building across the street. The family has raised $3,000 through solicitations and fundraisers such as a craft show and a food sale. Once the results of Saturday’s fundraiser are in, Ward will be able to order the visor. Short has chosen the white version. The Lions Club, which is celebrating its 100th anniversary this year, has made helping the blind and visually impaired one of its key missions. Debbie Maddox was the Manchester Lions Club president last year when Ward was seeking a donation. The club obliged with $500. 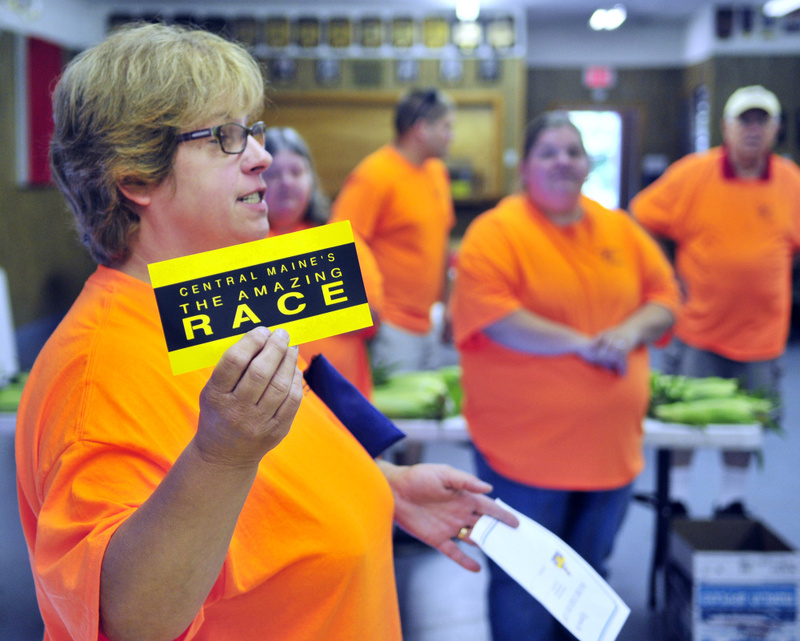 But Maddox, who is a fan of “The Amazing Race,” also had the idea to develop a central Maine version as a fundraiser and brought that to the club for consideration. A contestant gets a clue for the next challenge Saturday during a Central Maine Amazing Race fundraiser at the Lions Club in Manchester. On Saturday, the idea became reality. Fifteen two-person teams gathered to hear their instructions and complete their first challenge. To compete, each team had to pay an entry fee. In addition, teams earned points for every pledge they collected. At one point for every $25 raised, Norm Hart and Zach Hart had a commanding lead before they even started with their $2,000 in combined donations. 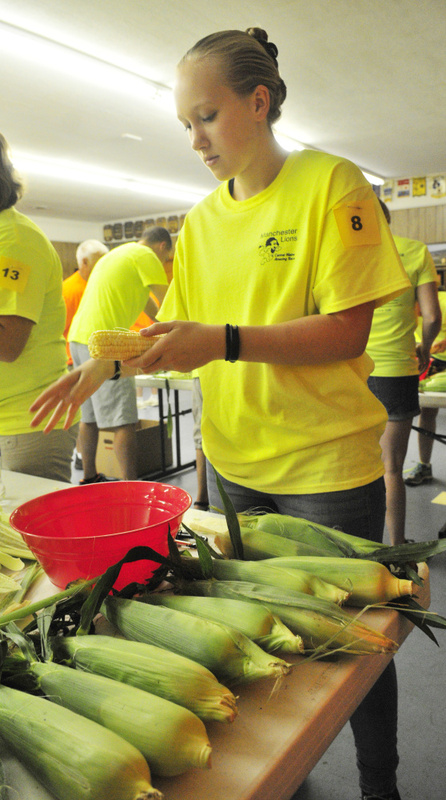 The teams’ first challenge was to take turns shucking a dozen ears of corn for the banquet at the end of the day. When that was done, they could check in and receive their next task. The race course took them to businesses and public spaces in Augusta, Hallowell, Gardiner and Manchester. Before they were done, they would have to complete specific challenges. At Sparetime Recreation, for example, they would have to bowl a strike and score a specific number of points before they could continue. 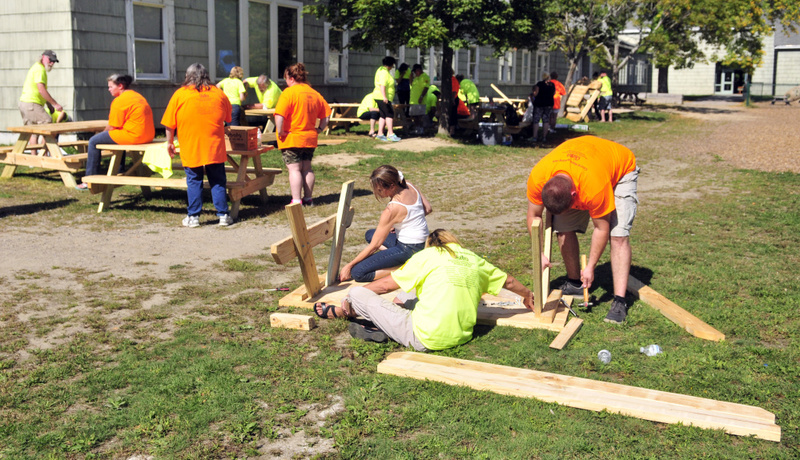 In Gardiner, the teams’ challenge was to assemble a picnic table for the Boys and Girls Club of Kennebec Valley. Maddox said whenever possible, businesses were included to promote them; and where possible, as in the case of the Boys and Girls Club, the contestants were given a task to help the organization. The day came with challenges that were not a part of the race. Teams were finishing tasks earlier than anticipated, prompting an unscheduled pit stop and juggling destinations. Among the teams competing were Short’s grandson Jozef Short and his cousin Kassandra Rolling, both 17. Jozef Short said he thought his team would do better than some, maybe better than most. As it happens, theirs was the last team out the door after the corn-shucking challenge, but even if they didn’t improve their rankings at all, their family already had won.